Are you a small or medium business in West Lothian? Do you want to speak to your local parliamentarians about the impacts of Brexit? I would like to invite delegates from your business to join me to discuss any current or projected implications to your business with regards to Britain’s exit from the EU. This is a listening exercise I will be hosting alongside other locally elected representatives in West Lothian. I will also be inviting a selection of business representatives from a range of backgrounds to speak about their experiences so far. The format will be very relaxed and will be an opportunity to hear from you. 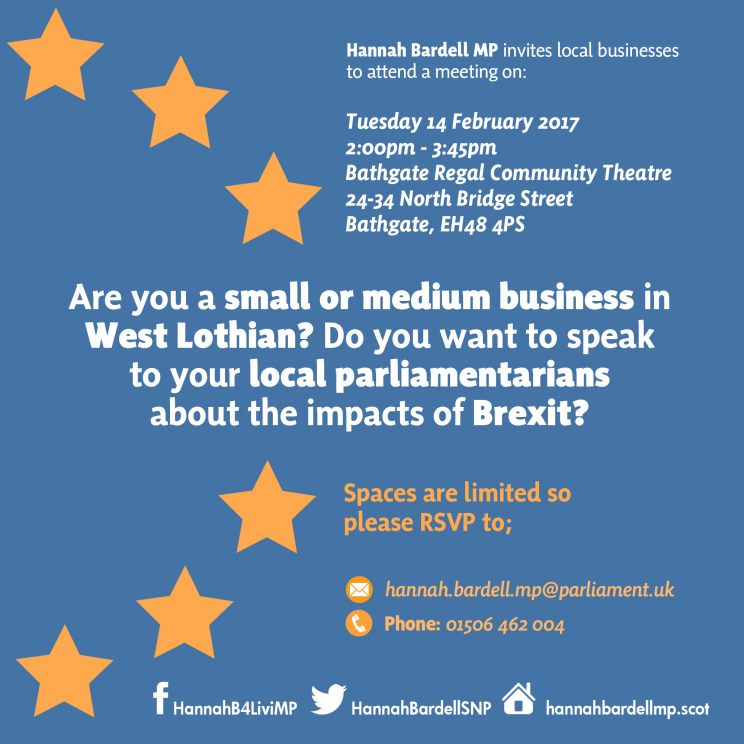 The meeting will take place on 14th February 2017, 2pm-3:45pm at Bathgate Regal Community Theatre, 24-34 North Bridge Street, Bathgate, EH48 4PS. I do hope you can join me on the day and I look forward to welcoming you all. Please RSVP to Hannah.bardell.mp@parliament.uk or on 01506 462 004.